The Natal Historic Centre is a particularly interesting part of the city and contains some 150 different buildings, many of which are colonial landmarks in their own right, with neoclassical facades and contrasting modernist architecture. Specific landmarks in Natal include the Universidade Federal do Rio Grande do Norte (Federal University of Rio Grande do Norte), the Forte dos Reis Magos (Fortress of the Three Wise Men) and the Ponte Newton Navarro (Newton Navarro Bridge), which is actually one of Brazil's largest and most substantial cable-stayed bridges and is used by an average of 25,000 vehicles each day. Located within the Lagoa Nova area of Natal, the Universidade Federal do Rio Grande do Norte was founded in 1958, being funded by the Brazilian federal government. The university has grown greatly in both size and stature over the years, being listed amongst the 20 best universities in South America, and currently ranks as the 11th in Brazil. Many architectural gems are scattered around the campus, with the eastern side being bounded by coastal dunes and the western side linked to the city centre by prominent roads. Often referred to as simply the 'UFRN', the Universidade Federal do Rio Grande do Norte is today called home by almost 35,000 students. In total there are 60 different departments and some 50 undergraduate courses. The star-shaped Forte dos Reis Magos goes by a number of different names in Brazil, being also often known as the Fortaleza da Barra do Rio Grande, or alternatively, as the Fortaleza dos Reis Magos. This very distinctive medieval fortress was completed at the end of 1599, when it became one of the earliest landmarks in the city. The bright-white facade is especially striking, being further enhanced by its waterfront setting and subsequent reflections. Of interest, the fortress earned its name since construction began on January 6th 1598, an important date on the Epiphany Catholic calendar, honouring and remembering the visit of the Three Wise Men. The Ponte Newton Navarro spans the Potengi River and links the North Zone and its coastal cities with the South Zone. This bridge serves two main functions, easing the heavy daily traffic on the nearby Igapo Bridge and providing a direct route to the Greater Natal International Airport. Named after a prominent local artist, Newton Navarro, the bridge was completed in November 2007. 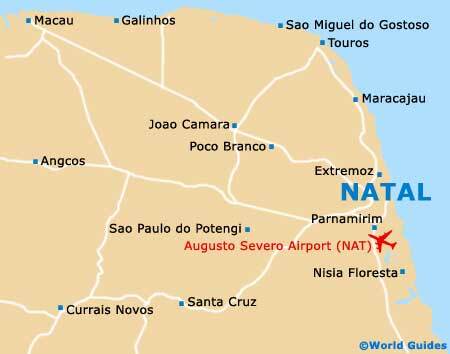 Located on the headland of Brazil's north-eastern Atlantic coastline, the Cabo de Sao Roque is located approximately 30 km / 19 miles to the north of Natal. This has become something of an important natural landmark, since it is frequently referred to as being the most easterly point in South America. However, the true easternmost extremity of this continent is actually Cabo Branco (Cape Branco), sited directly to the south-east of the city, some 190 km / 118 miles away.